Michel Kikoïne (Belarusian: Міхаіл Кікоін; Russian: Михаил Кико́ин, Michail Kikóin; 31 May 1892 – 4 November 1968), was a Litvak-French painter. Kikoine was born in Rechytsa, present-day Belarus. The son of a Jewish banker in the small southeastern town of Gomel, he was barely into his teens when he began studying at "Kruger's School of Drawing" in Minsk. 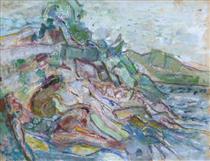 There he met Chaim Soutine, with whom he would have a lifelong friendship. 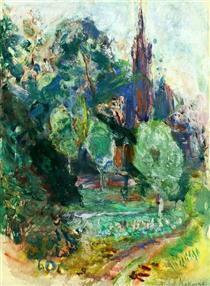 At age 16, he and Soutine were studying at the Vilnius Academy of Art and in 1911 he moved to join the growing artistic community gathering in the Montparnasse Quarter of Paris, France. 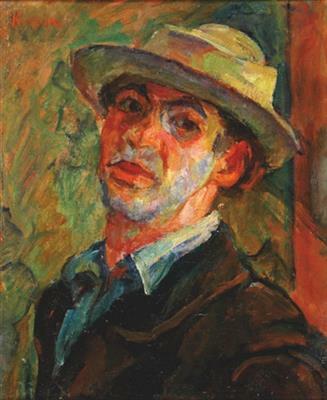 This artistic community included his friend Soutine as well as fellow Belarus painter, Pinchus Kremegne who also had studied at the Fine Arts School in Vilnia. For a time, the young artist lived at La Ruche while studying at the École nationale supérieure des Beaux-Arts. In 1914, he married a young lady from Vilnia with whom he would have a daughter and a son. 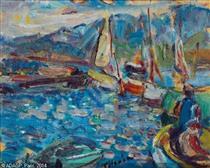 Their son, Jankel Jacques, born in France in 1920, also became a painter. The same year as his marriage, Kikoine volunteered to fight in the French army, serving until the end of World War I. With the outbreak of World War II and the subsequent occupation of France by the Germans, Michel Kikoine and his Jewish family faced deportation to the Nazi death camps. Until the end of the War they stayed near Toulouse. After the Allied liberation of France, he moved back to Paris where his paintings were primarily nudes, autoportraits, and portraits. In 1958, he moved to Cannes on the Mediterranean coast where he returned to landscape painting until his death on 4 November 1968. Michel Kikoine had his first exhibition in Paris in 1919 after which he exhibited regularly at the Salon d'Automne. 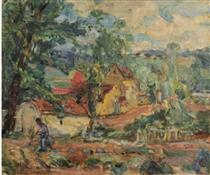 His work was successful enough to provide a reasonable lifestyle for him and his family allowing them to spend summers painting landscapes in the south of France, the most notable of which is his "Paysage Cezannien," inspired by the great Paul Cézanne. He died in Cannes, France. In 2004, at the university in Tel Aviv, Israel, a new wing in the Genia Schreiber University Art Gallery was dedicated to the memory of Michel Kikoine. 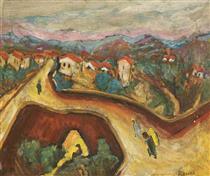 Figures on a Winding Path Michel Kikoine ? Les Baigneuses Michel Kikoine ? Dans Le Jardin Michel Kikoine ?